Why? Your co-caine loving fly boy was too Christian and too moral to have extramarital affairs? Pardon me? I have always said a vote for Clinton's is a vote for Bush. rule, and posted information exposing this crock of b.s. now found another vein into her her being. The crook dynasty sticks together. BTW not saying Trump is innocent, actually he may even be paid by or has paid Hillary in a troll fest against America. Flash back to the Bush years... adultery may have included his "male suitors". 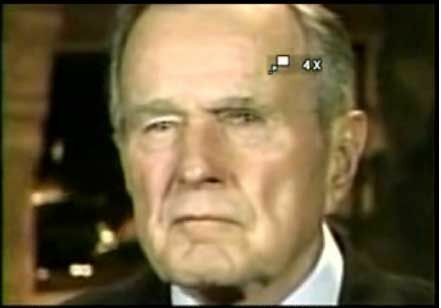 George H.W. Bush to vote for Hillary. ...Kathleen Hartington Kennedy Townsend, the former Maryland lieutenant governor and daughter of the late Robert F. Kennedy. So this is 2nd hand information but is it reliable? Would it really surprise anyone if true? Trump himself has been a big supporter of the Clintons over the years. So it should be no surprise that the signer of the original AWB and Mr. United Nations/NWO may be supporting her. Import Ban on Assault Rifles Becomes Permanent. Bush's New World Order speech. I can confirm that this story is complete BS. I have a close friend that was in Kennebunkport at the same meeting and has the same picture and was right there when she was with Bush and he never said anything of the sort to her. She is a complete liar and just trying to garner support for who she supports. I have the picture of my friend in the same chair in the same room with them...shaking hands with Bush too. The fact she is claiming this is hilarious. "As much as I'd like for it to be true, I was in the same room meeting the same ex-Potus Kathleen Kennedy Townsend was. She was two folks behind me in line at a private function at their home for Points of Light. George HW Bush didn't make an endorsement of Hillary Clinton. Who knows what was said between the two of them, but there was certainly no endorsement. There was, however, really good carmelized bacon wrapped around melon balls. And an original 43 hanging on the wall. Trust me, if he had, I'd be the first to tell you." Everyone supports the Clintons, until they run against them.